Oveja Negra: A wine wanting to be a little more bad-assed than it is. After a hefty day of lawn care in the SoMo (South Minneapolis) and a cold afternoon at that, I was as tired as if I were training for an Ironman. Lawn bags were filled and carried; dead patches were raked and seeded, and just a general, “get it done” mandate was given by current roommate. Steak and cabernet sauvignon, like a heavy training day, seemed to be called for. I was like the wet wash cloth by the side of the tub that was cold, tired, and rung out. 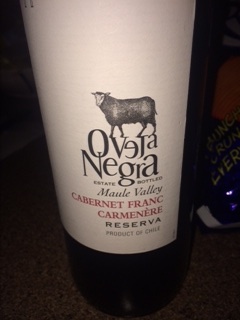 Said roommate, however, being the master cook she is, decided to whip up pizza, and I wanted to try the wine I purchased from “Elevated.”–The wine: Oveja Negra, 2011 blend of Cabernet Franc and Carmenere. It was a wine from Maule Valley, Chile, and while a narrow country, it has a lot of diversity–depending on which side of the A ndes one is on. “Meh” not “Ahhh” greeted by upon opening. It was earthy, but not fruity on the nose, with slightly green hints of capsicum. On the palette it was light fruit in taste, black current, capsicum, smokey wood-chip oaked (just a guess since the taste seemed to linger on the surface rather than rooted in the wine), and was a young, spicy, peppery wine. 13.5% in booze, medium-high tannin and some balance, but I’ve seen pictures of goats (I know, not a sheep) and this wine was not going to balance on any steep mountain tops. I forgot how much I paid for it, but I like to think a little Black Sheep is good to change up the dynamics of staid and boring. This wine would never be confused with Yahtzee on the scale of shaking things up. Will finish the bottle, but put it down after a glass and a half to make the run this morning. It was a little less blah with some pizza, but attribute that more to the talents of my roommate than the wine. Make a sweater and move on.